Injuries and inconsistency plagued Russia’s NHL contingent for much of what was a lackluster season in 2013-2014, with isolated successes failing to compensate for the national team’s humiliating quarter-final exit on home ground at the Sochi Winter Olympics. Fans will hope that the new campaign, which got started on Oct. 8, brings Russia’s stars better fortunes on the ice. 2013-14 was not a banner season for Russia’s NHL stars. Yes, there were smiles after they won the IIHF World Championship in Belarus under new national team coach Oleg Znarok. But that didn’t atone for the home-ice failure versus Finland in the quarter-finals of the Sochi Winter Olympics. And in North America, only Slava Voynov of the Los Angeles Kings celebrated with the Stanley Cup. So there are big question marks surrounding Russia’s best as we enter the new NHL campaign. Can Alexander Ovechkin elevate his game after the Washington Capitals missed the playoffs for the first time since 2007? 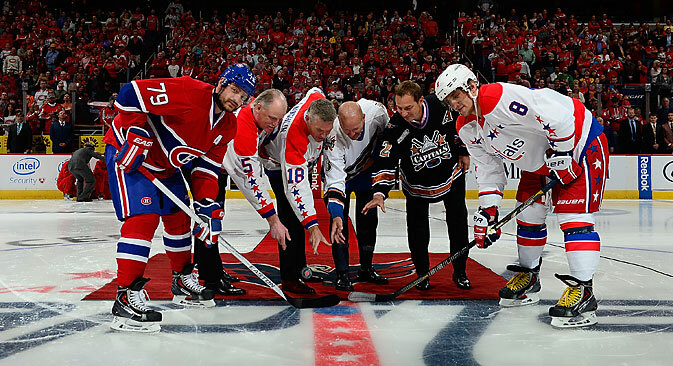 The smart money says that under new bench boss Barry Trotz, “The Great 8” will continue terrorizing goalies. He scored a league-best 51 goals last year for his fourth Rocket Richard Trophy. But despite Trotz’s best intentions, Ovechkin’s questionable defensive play will likely persist too, even if he improves on last year’s -35 plus-minus rating (the NHL’s third-worst). Two-time World Championship gold medalist Yevgeni Kuznetsov will also be scrutinized in Washington. Still eligible for the Calder Memorial Trophy [an annual prize awarded to the player deemed the most proficient in his first year of NHL competition – RBTH], the 22-year-old Chelyabinsk native showed flashes in his first 17 games (3-6-9) last season. Yet the gifted sniper may struggle with the consistency needed to center Washington’s second line. If so, the club’s tenuous playoff hopes will further recede. The Pittsburgh Penguins, meanwhile, hope superstar pivot Evgeni Malkin will bounce back. Injuries limited the two-time scoring champ to 72 points in 60 games last year, and he missed training camp with an undisclosed ailment. Who’ll shine brightest among Russia’s two Olympic netminders? Despite stumbling against the Finns in Sochi, it was Colorado’s Semyon Varlamov who had a bigger impact in 2013-14 than Columbus’s Sergei Bobrovsky, earning a Vezina Trophy nomination. But defense isn’t the strong suit of coach Patrick Roy’s Avalanche. That will make it tough for Varlamov to maintain his level. The 26-year-old made an NHL-high 1,867 saves in 63 games last year. That final sentence could also apply to Bobrovsky. The 2013 Vezina winner is machine-like in his dedication to his game. Although his play slumped in the playoffs versus Pittsburgh, the ultra-quick 26-year-old should continue to boost the improving Blue Jackets. Expect “Bob” to play more than 60 games for the first time ever. Meanwhile, for some key Russian veterans over the age of 35, this year is likely to see their games decline. Center Pavel Datsyuk will miss the start of Detroit’s season with a separated shoulder. Hockey’s greatest stickhandler was also hobbled in Sochi with a bad knee. Although he performed heroically there, the 36-year-old, earning $7.5 million this year, won’t likely approach his career high of 97 points from the Cup-final seasons of 2008 and 2009. Datsyuk can still model the two-way game for his younger teammates, though. “Now we’ll just stick together and play our hockey and hope we don’t have many injuries,” said Datsyuk. Defenseman Andrei Markov’s prospects brightened when his flamboyant Montreal D-partner, 2013 Norris Trophy winner P.K. Subban, landed a new long-term deal in August. Markov, 35, knows how to settle down Subban. And if healthy, the Voskresensk veteran could match the 43 points and +12 rating he earned last season. The Canadiens are rising. In Dallas, Sergei Gonchar should become the first Russian blueliner ever to hit 800 points (currently at 797). However, the 40-year-old fractured his ankle in pre-season, so that milestone will have to wait. This year is possibly Gonchar’s swan song. There is hope, though, among the next generation of Russian NHLers. Gonchar’s protégé, Valeri Nichushkin, made magic on Dallas’s top line with top-10 scorers Tyler Seguin and Jamie Benn last year. Watch for comparisons between the huge-framed 19-year-old and Malkin to increase. In St. Louis, winger Vladimir Tarasenko, 22, has the toolkit to improve on his sophomore season (21-22-43). He netted four goals in six 2014 playoff games. And while Nail Yakupov’s individualistic style, reminiscent of Maxim Afinogenov, is unlikely to win over Edmonton’s management, it’s too early to give up on 2012’s number one overall pick. In the early 2000s, there were more than 70 Russians plying their trade in the NHL. Today there are about half as many. But there’s still quality to be found.